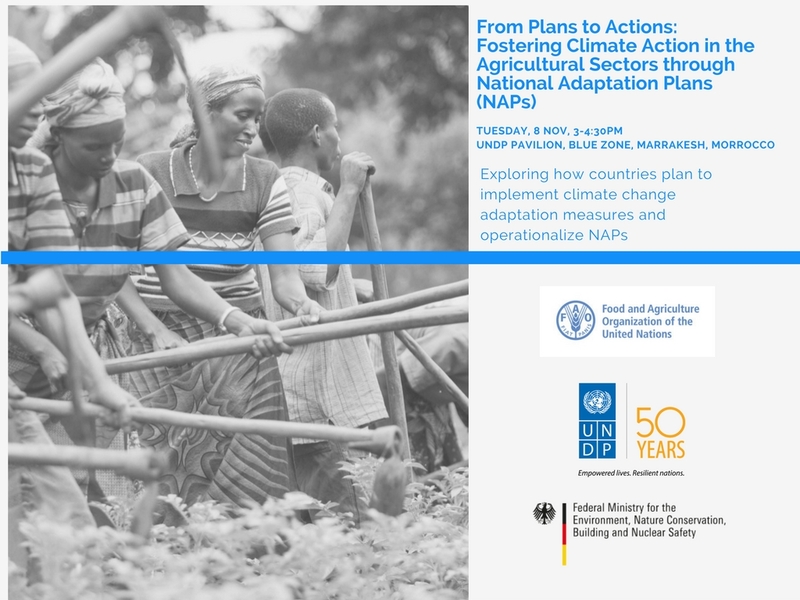 This side event consisted of a panel of nine speakers, including representatives from four of the 11 countries currently engaged in the UNDP/FAO collaboration for 'Integrating Agriculture into the NAPs' (NAP-Ag) as well as representatives from the UNDP, USAID, NAP-Global Network, and the German Ministry for the Environment (BMUB). Moderator Julia Wolf (FAO) gave the opening remarks. She said, "Adaptation in agriculture is highly significant - with 131 out of 189 countries mentioning it in their list of adaptation priorities." Ilka Wagner (BMUB) spoke briefly about the role of the BMUB in the NAP-Ag program, which is working in 11 countries with over 15 million Euros in contributions from the BMUB. Pradeep Kurukulasuriya presented the results of a country case study (Sri Lanka) developed as part of the USAID Adapt Asia-Pacific/UNDP Economics of Adaptation programme. He said, "It is important to ensure that the program activities in each country are aligned with the global topics being discussed and negotiated, as well as to contextualize the threat to agriculture posed by climate change in economic terms." He said that in In Sri Lanka, for instance, $94 USD per hectare could be lost due to climate change, resulting in rising poverty levels and a general movement backwards rather than forwards. Rohini Kohli from UNDP followed with an overview of the NAP-Ag program and its relevance moving forward - especially through integrating agricultural concerns into the overall NAP process. The event featured the launch of an animated film that highlighted the risks posed to agriculture by climate change and the influence that NAP-Ag will have in addressing these impacts. The video noted the particular importance of agricultural adaptation, as food insecurity has a disproportionate impact on the world’s poorest and most marginalized peoples, and therefore must be addressed through the lens of equity as well as the need to supply food for an increasing population. John Furlow from USAID raised the issue of integration and linking the work of the NAPs to the Paris Agreement and NDCs without a blueprint – since the work being done by NAP-Ag has never been done before, all involved parties are learning as they go. The panel discussion that followed considered the importance of understanding the economic implications of the damage done to the agriculture industry and the livelihoods that are dependent on it if no action is taken. Representatives from the Philippines, Uruguay, Thailand, and Gambia gave presentations on the experience of their countries with implementing the NAP-Ag framework. Panelists discussed their country’s experiences and challenges with negotiating the intersection of NAPs and agriculture. Several panelists outlined their countries’ strategy of making adaptation a long-term plan. Atty. Railla Veronica D. Puno from the Philippines said, "The National Climate Change Action Plan in Philippines is operating on the timeline of 2011-2028, overlapping three separate administrations - to maintain its independence from the policies of a single national administration." Panelists agreed there is a need for increased dissemination of information and increased understanding at the individual and policy level. Sidat Yaffa from the Gambia said, "There is a need to improve understanding and awareness of the NAP process in the Gambia - as one of our three primary objectives for the NAP-Ag program." Several issues were highlighted by each of the country representatives, and reiterated by the speakers from the UNDP, USAID, and BMUB; the need for more effective and widespread communication of information about adaptation in agriculture to local communities; the necessity of south-south cooperation and peer-to-peer exchange with sharing of best practices; and the importance of tying agricultural adaptation to its impacts on other national and international sectors. Panelists and participants agreed that understanding the tangible consequences of inaction on agricultural adaptation is essential to motivating the cooperation of national ministries and industry leaders. Closing remarks from UNDP and FAO highlighted the vision moving forward, driving home the need to start translating the planning stage of the NAP process into specific actions, and ensuring that agriculture sector concerns are integrated into the overall NAP process.